I’m delighted to announce that How to Get Your Book Into Schools is part of the Write Stuff 2018 bundle for writers. This collection, curated by the great Kristine Kathryn Rusch, includes eight books, a video series, and a 30-day program. All for just $15. Here’s what Kris has to say about this bundle, available here. I am so excited about this year’s spring writing bundle. Out of all of the nonfiction bundles I’ve compiled, this one has the largest number of books that appeal to me. I’ve been writing and publishing for a long, long, long time. Sometimes I feel like no one can teach me anything about writing. So, in the past, when I’ve compiled these bundles, I did my best to make bundles that would help all kinds of writers. This year, that includes writers like me. 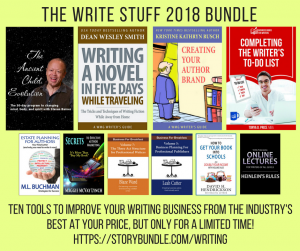 In this bundle you’ll find ten different writing products. They have a lot to teach you. If you’re just noodling around with the idea of writing, then Blaze Ward’s Three-Act Structure For Professional Writers will help you a lot. Tonya D. Price’s book Completing Your Writer’s To-Do List will help you organize, and will make you more efficient. For those of you who have already published books, whether just a few or quite a lot, the remaining books on this list will help you with the business of publishing. New novel, Offensive Foul, available now!